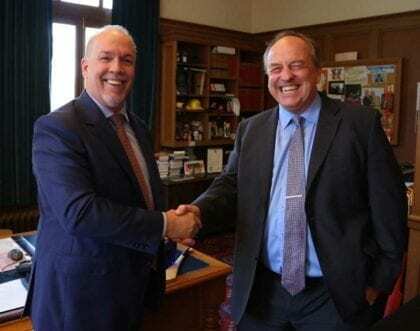 John Horgan and Andrew Weaver. Credit to: British Columbia New Democratic Party. Since the 30th of May 2017 that British Columbia (BC) political parties NDP (New Democratic Party) and Greens have an agreement signed to collaborate in the present regional legislature, which can be read in the NDP webpage. This comes after an historical regional election process which saw the end of the Liberal Party majority in BC, held since 2001. Other issues covered by the agreement are the maintenance and improvement of public services (mainly health and education), rolling out of environmental protection policies such as expanding the polluting emissions tax and measures to set better democratic mechanisms in BC. It becomes clear from this general political party agreement that basic income is a part of a broad set of policies which aim at improving British Columbians lives, while protecting the environment and established public services. I wholeheartedly support basic income. Especially rent rate is too high a finacial burden for low income families. Please check out rent rate in bc. I am afraid it has gone too far. Living on disability and social assistance is below poverty. We can’t afford food tampons or toilet paper. Can’t afford to do laundry or travel to any appts. Its daily thouggts of suicide. Just another reason for pursuing the basic income road.